Describe your wedding just in three words. Nestled in the picture perfect Cornish countryside the Boconnoc House and Estate is steeped in history with beautiful Georgian details. Bridesmaid dresses were designed by design Sorella Vita and purchased from Puure Bridal in Lymm. If you had to choose one highlight from the big day what would it be? There are so many wonderful memories but definitely meeting Pete after walking down the aisle. Wedding ceremony conducted by Cornish Celebrants who specialise in bespoke ceremonies. Do you have any tips for couples in the process of wedding planning? Don’t get too bogged down with Fashionable items or the current Fad, stick to classic designs and decor that you can look back on in in years to come. Also try and make it personal and include things that tell your story. Remember to have fun, it should be a fun experience planning your dream day. 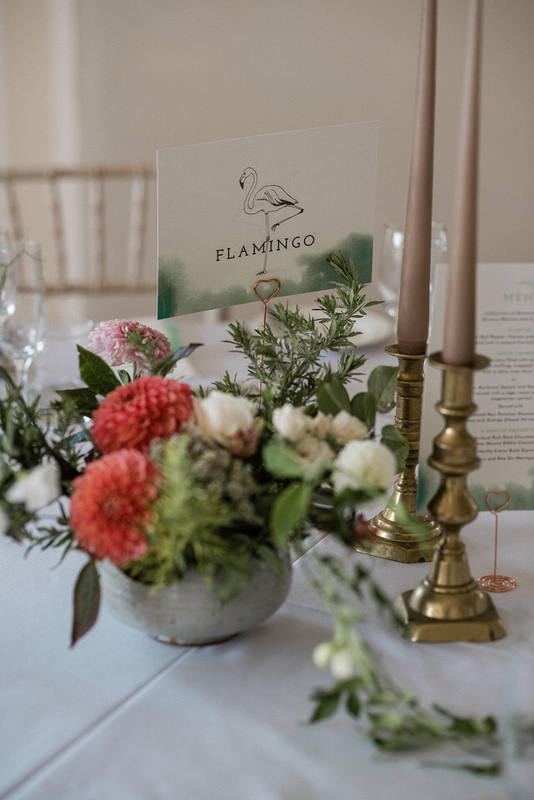 To coordinate with their invitations we created table names, menus and a table plan all featuring the signature green watercolour paint pattern. As well as cake Bethan and Peter treated their guests to a tower of cheese by the Cornish Gouda Company. 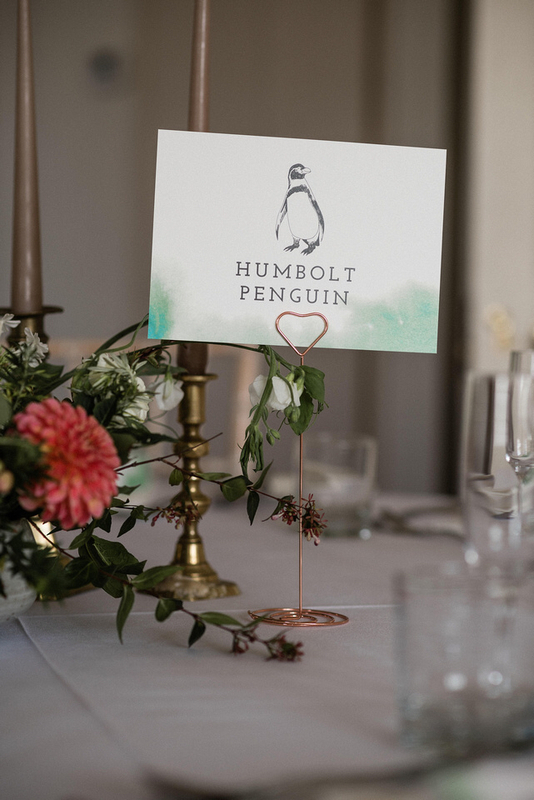 There were many personal touches in your wedding decor including the illustrations we created for your table names of animals from Peru, what is your connection? Pete and I actually met in Peru, we were both travelling on a G adventures tour and have been inseparable since. So Peru is a very important part of our story. We were honoured that you chose us to create the stationery for your wedding day, what did you enjoy about working with us? You were amazing, you produce unique, innovative and fun designs that are still beautiful and elegant. Everyone at Dearly Beloved was happy to be creative with our Peru theme and was so quick and efficient. The products were beautiful and excellent quality. We will definitely be using you again. 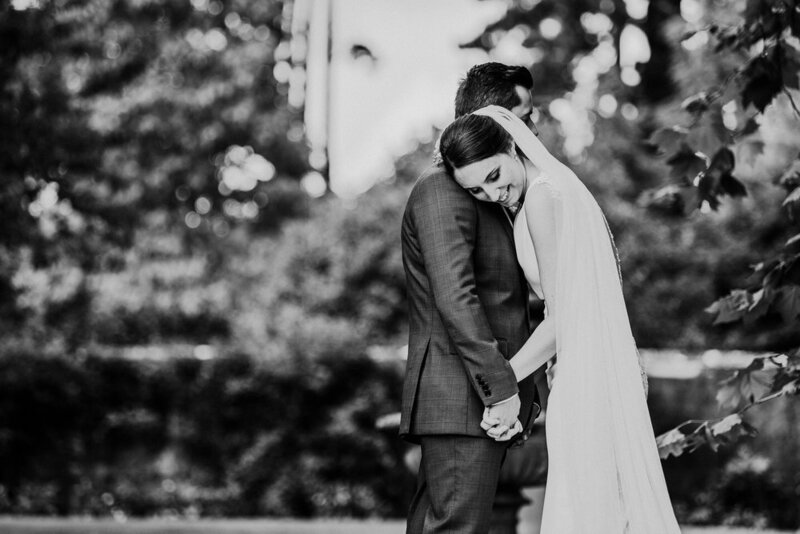 Bethan’s stunning lace gown is by Pronovias and purchased at Kuntsford Wedding Gallery.